To say that the last couple of weeks have been sore ones for Carlow football wouldn't be quite cutting it. Fresh from being relegated to Division Four after Midlands rivals Offaly snatched a late, late point to earn a victory over Sligo - and subsequently survival - on the final day of the National Football League season, the Barrowsiders' spring sorrows have been compounded today. At a meeting of the GAA's Central Hearings Committee earlier, a 20-week backdated ban was handed down to manager Turlough O'Brien after the ugly scenes that marred his side's home defeat to Down earlier in the league campaign. Cork referee James Bermingham incurred the wrath of the majority of Dr Cullen Park on the day when, after awarding Down a late free from which they nudged ahead of their hosts, he then failed to award Carlow a free-in in the last throws of the game when one of their forwards hit the deck under pressure from the Down backline. Instead the official sounded the full-time whistle and he was confronted by an irate contingent of Carlow players and management, as well as some fans, who remonstrated with Bermingham as he tried to make his way from the field. O'Brien, along with midfielder Brendan Murphy and coach Steven Poacher were charged with 'Threatening Conduct towards a Referee' with all three cases upheld at this afternoon's hearing. Murphy and Poacher have each been slapped with 12-week bans for their part in the incident that run from the day of the Down clash. Should the trio either fail in an appeals process or indeed decide not to pursue one, it would mean O'Brien would not be eligible to tread the whitewash until the weekend of the All-Ireland semi-final - a stage that his side is highly unlikely to appear on. Poacher and Murphy could, however, be available for a potential Leinster semi-final on June 9th should the minnows get through a resurgent Meath side in the quarters. 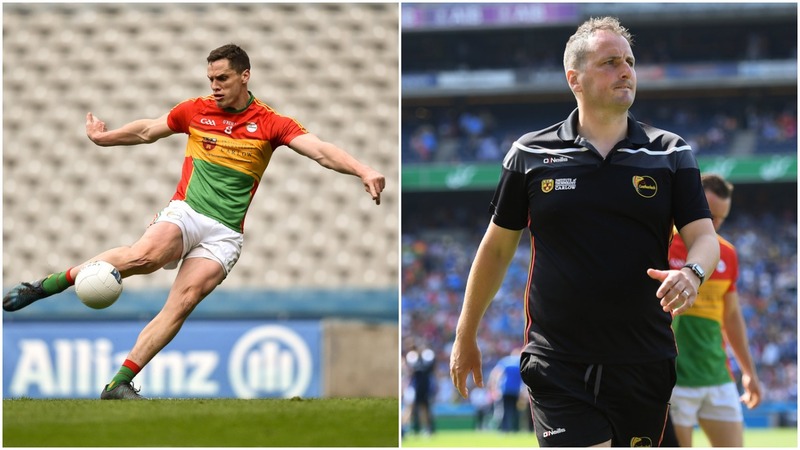 It caps a disappointing start to the year for a Carlow side who seemed to have momentum in their favour after a breakthrough year in 2018 saw them promoted to Division 3 and reach the Leinster semi-final after impressive wins over Louth and Kildare.